I would like to tell you about two of my favorite camping spots in the Whiteface Region of the Adirondacks: Cooper Kiln Pond and the Whiteface Brook Lean-to. While many more camping options do exist (for example: Taylor Pond State Campground, Copperas Pond lean-to, and Wilmington Notch State Campground), I have a fondness for these two primitive locations. 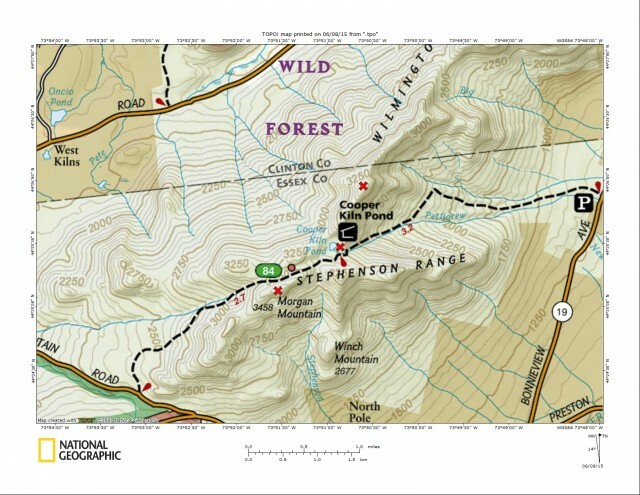 Nestled between Wilmington Peak and Morgan Mountain, deep in the Stephenson Range, rests a lean-to on Cooper Kiln Pond. On many, many, occasions I have been back to this lean-to, and in all seasons I might add, and honestly I can’t say which season it exists in more peacefully. The camping area and lean-to can be accessed from two areas: 1) from Bonnieview Road, and 2) from the base of Whiteface Mountain along County Route 18. I have been in from both directions, but with a full pack, only from the west on CR18. If starting from Bonnieview Road you need to plan a slightly longer trek and much more elevation gain, I always opted for less of both. My full pack typically consists of much more than freeze-dried delicacies, but actual hydrated food like bacon, eggs, frozen burger patties, bricks of cheese, loaves of bread, hot dogs, you name it, heck even Spam on a few occasions. I have even carried in a 12-pack of PBR on occasion to wash it all down, and as far as I know you can’t buy freeze-dried ale. 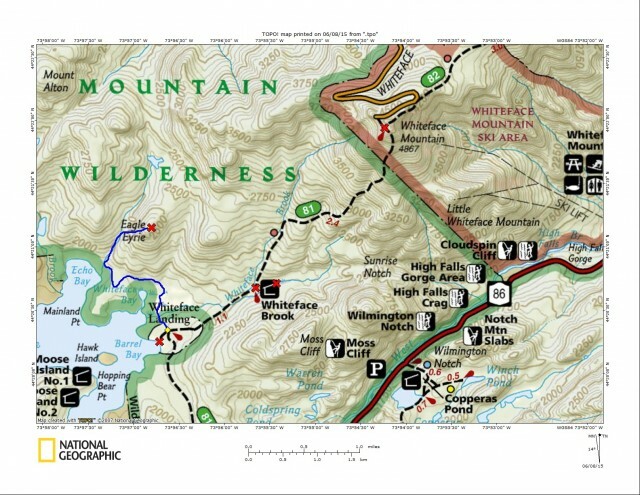 One of the main reasons I enjoy Cooper Kiln Pond so much, other than that it's very peaceful and has a ton of wildlife, is the option it gives me to climb two of the Adirondack 100-hghest peaks: Wilmington Peak and Morgan Mountain. Sure, they can both be done as day trips or even both in a day, but to add in the peace and relaxation of a back-country midnight setting is a full package. To reach this peak from camp you will need to hike toward the CR18 trailhead to the highest point and follow a very obscure herd path, or bushwhack to the summit. The summit rests at nearly 3500’ in elevation. A wonderful view is slightly further southwest along the ridge atop a small open cliff. This bushwhack is as easy as it gets, but like with all off-trail travel, I recommend you bring a GPS and/or map and compass and know how to use them. Wilmington Peak lies right behind the lean-to over the steep slopes you can see so clearly. There is a faint herd path along the shore of the pond that will get you closer to the base, but from here, the herd path up onto the ridge is fading away. There used to be a defined herd path that would access you quite close to the summit, now you will have to orient yourself along the ridge and back to camp. Along the ridge you can enjoy some nice views, but that will be all you're afforded. I wish I could say fishing is fantastic here, but honestly I don’t feel you will have any luck. However, if you enjoy the looks and sounds of wildlife, birds, and frogs, this camping area will be right up your alley. This lean-to camping area is much longer of a hike than Cooper Kiln Pond, but that doesn’t stop me from adding too much food and equipment to my backpack. The biggest downfall to this site is if it's occupied, that’s all you've got - there are no designated tenting sites to fall back on. If occupied what you would need to do is make a small site that is no less than 150 feet from the trail, lean-to, and water source. It is not only very important that you follow these guidelines, it is required. It is also very important to break it down completely before you set off - make it look as though no one was there as to not inadvertently start a trend. If you create a fire ring, disperse the stones and cover the ashes, making sure it is completely out. Touch it with the back of your hand to look for warm spots, it needs to be cold and soaked and 100% out before you leave. Brush in or leaf in the campsite to give it that unlived in look, make it wild again. Carry out all rubbish and bury human waste at least 6-inches deep. Again what I love about this lean-to site is its close proximity to nice hiking. One major downfall, which isn’t really all that negative, is that it’s right on the trail. This lean-to is on the southern approach to Whiteface Mountain. It also happens to be the most difficult and demanding approach to the peak. Your rest spot lies only 2.4 miles from the summit, but be prepared. To reach the outstanding views from this Olympic mountain you will have to work for it. The rocky and steep trail is most rewarding in itself, one truly worth a look. This landing is not only a neat destination for a sunset shot but also a nice spot for an evening swim. You should have this dock all to yourself as the evening progresses. A perfect spot for some wine and cheese as well as a cooling dip before the sunset comes in. Maybe even wake up early in the morning as the colors rise behind you to welcome you to a brand new day. Eagle Eyrie is a small mountain with a very special value to it - it hardly ever gets visited. Located along an old Shore Owners Association Trail that loops around the lake you will be awed by the unique view out over the lake. An easy climb through the forest preserve is all it takes to visit this location and a camera should be required. Want a bit of adventure? Head out from behind the lean-to toward Sunrise Notch. There are no trails but just up the brook you will quickly come to a most rewarding grassy wetland with interesting views of Whiteface Mountain and the steep slopes of Sunrise Notch Mountain. So... when will we see you out there? Start planning your next Whiteface Region camping trip now - the mountains are waiting! Cool camping in the Adks. Choices, choices, choices (15 actually)... where you goin' to pitch it?